Ocean currents, landscape features, towns, universities, wildlife: these are just a few of the many things named after the polymath Alexander von Humboldt, widely known and respected as the “most scientific man of his age” (to quote American president Thomas Jefferson). von Humboldt’s contributions to science were not just to particular fields of research, but also in the form of study techniques, collaborative culture, styles of thinking and communicating, and application of findings. He is also notable for making science accessible to laymen, and, in the process, inspiring art, conservation practices, and enlightened social policy. Today, von Humboldtis no longer the household name it once was. How was a man like this forgotten—and what shaped him to begin with? 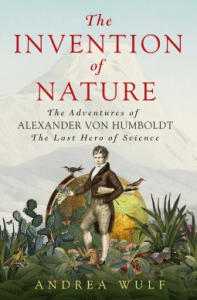 Andrea Wulf seeks to answer these questions in her multi-award-winning The Invention of Nature: The Adventures of Alexander von Humboldt, The Lost Hero of Science. Because of von Humboldt’s central position in the global scientific community and his ability to bring together both potential collaborators and disparate topics, Wulf calls him “the hub of a spinning wheel, forever moving and connecting”. This is also a good visual for the way in which the author uses von Humboldt’s biography as a central theme from which she branches out to explore the evolution of science and society’s relationship with it. The Invention of Nature is ambitious, which not only tells the story of a single interesting man, but also contextualises his intellectual contributions. Accordingly, the book sometimes feels as densely packed with information as von Humboldt’s homemade box-and-envelop filing system. For example, when discussing how von Humboldt changed science, Wulf first recounts previous research practices in detail before exploring von Humboldt’s modifications and then examining their modern manifestations. To demonstrate how von Humboldt sowed the seeds of contemporary nature writing, Wulf relates how his predecessors described their environments and then quotes both von Humboldt’s work and that of more current authors. And so on, for each of von Humboldt’s accomplishments—and there were many—Wulf provides both a history lesson and a comparison with contemporary culture; she even includes eight chapters with entire biographies of other great thinkers influenced by von Humboldt. Between these tangents and the repetition of some information in multiple places, the narrative thread is sometimes temporarily lost in a tangle of fact. That said, one of the most remarkable aspects of the book is its extensive referencing of primary materials. The author cites correspondence, journals, notebooks, specimens, and multiple translations of scientific works (von Humboldt spoke and wrote in several languages); in researching the book, she even visited sites where von Humboldt conducted research. The resulting level of detail breathes life into the subjects, and, in particular, highlights the near-manic fervour that was both a gift and a curse to von Humboldt; although it spurred his prolific writing, it also ensured he was almost permanently restless. Wulf’s use of original quotations prevents The Invention of Nature from straying into the realm of hagiography; instead, readers can see von Humboldt as his contemporaries did: a man with genius, but also with flaws. 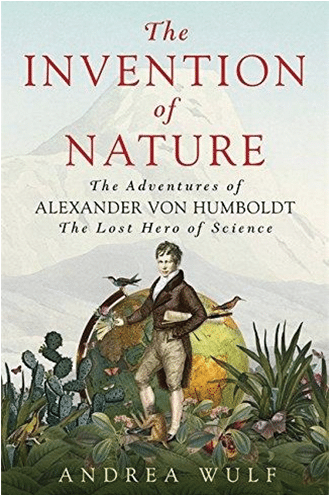 This multifaceted account of von Humboldt’s interdisciplinary life should appeal to a wide range of readers regardless of their age or area of expertise; his knowledge was so comprehensive, and his contributions so extensive, that there will inevitably be something here for everyone. The book also indirectly asks some profound questions for readers to contemplate long after turning the last page. For example: By pursuing increasingly narrow specialisms, do individual scientists prevent themselves from seeing, as von Humboldt did, how many diverse pieces connect to create a whole? Might our publication and funding practices hinder the sort of widespread enlightenment that resulted from the open and generous knowledge sharing that von Humboldt fostered? If we diminish the role of subjective insights in the search for “truths”, could we prevent the creative processes that so inspired von Humboldt? von Humboldt recognised that knowledge and power were intimately linked; he also saw that “nature, politics and society [form] a triangle of connections”. These seem especially relevant observations in a year that has brought us Brexit, the election of Donald Trump, and a growing feeling that we live in a “post-truth” era. In the context of these current events, Wulf’s epic story of a “largely forgotten” man whose “knowledge had bridged a vast range of subjects” including “art, history, poetry and politics alongside hard data” is infused with new meaning. It encourages the reader to value facts and to expend the energy necessary to verify them; it emphasises the dangers of elevating the worth of money over that of nature and of human rights; it celebrates the potential of art and nature to inspire and also to communicate. In short, it serves as an advocate for reason, initiative, pragmatism, and perseverance. We might do well to heed Wulf’s advice that we reinstate him as our hero.